Before exploring the parts of a compound microscope, you should probably understand that the compound light microscope is more complicated than just a microscope with more than one lens. First, the purpose of a microscope is to magnify a small object or to magnify the fine details of a larger object in order to examine minute specimens that cannot be seen by the naked eye. 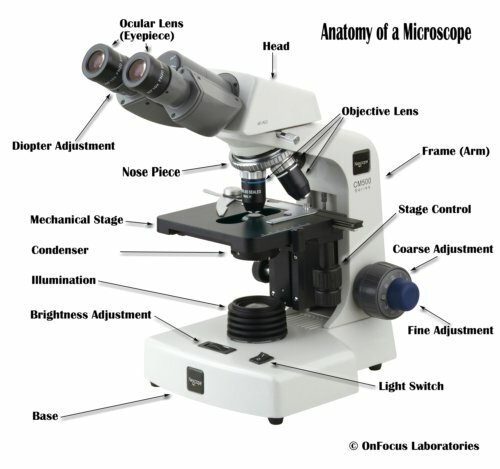 All of the parts of a microscope work together - The light from the illuminator passes through the aperture, through the slide, and through the objective lens, where the image of the specimen is magnified. The then magnified image continues up through the body tube of the microscope to the eyepiece, which further magnifies the image the viewer then sees. Learning to use and adjust your compound microscope is the next important step. It's also imperative to know and understand the best practices of cleaning your microscope. The parts of a microscope work together in hospitals and in forensic labs, for scientists and students, bacteriologists and biologists so that they may view bacteria, plant and animal cells and tissues, and various microorganisms the world over. Compound microscopes have furthered medical research, helped to solve crimes, and they have repeatedly proven invaluable in unlocking the secrets of the microscopic world.